Sangamam 2018, organised by Sunaad in the Capital, concluded with a befitting Veena recital and Ustad F Wasifuddin Dagar’s concert. While Saraswati Rajagopalan’s Veena concert on the concluding day of Sangamam 2018 left the rasika in a state of deep contentment, Ustad F Wasifuddin Dagar’s concert was truly a fitting finale to the classical music festival organised by Sunaad at the India Habitat Centre in the Capital recently. Saraswati Rajagopalan commenced the concert with a short sketch of raga Chandrajyothi ~ a janya of the 41st Melakartha ragam Paavani followed by Thyagaraja’s composition “Baagaayanayya ni maaya lento”. Vagadheeshwari is a raga steeped in the emotion of deep contemplation and meditative bliss. The raga alapana in the hands of Saraswati Rajagopalan ~ the long forays into the mandara sthayi, the deep jarus and the way the vivadi rishabha was treated ~ brought this emotion out in full measure. It prepared the audience for the Thyagaraja masterpiece, “Paramatmudu Velige”, which was played delightfully. Dikshitar’s Panchabhoota Krithi “Ananda Natana Prakasam” in Kedaram set to Mishra chapu tal came next, with the flavour of the raga brought out nicely. The main raga Poorvikalyani was elaborated nicely followed by Neelakanta Sivan’s composition “Ananda Natamaduvar Thillai”. Rajagopalan beautifully played Tanam and rendered Kalpanaswarams in charanam “Padhi madi jyoti palir palir ena”. 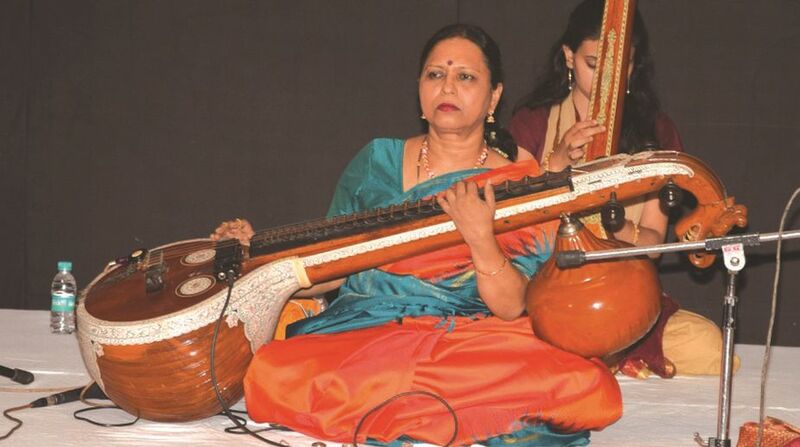 She also traversed the four ragas Poorvikalyani, Valaji, Varamu and Kalyanavasantham effortlessly in swarams. This was followed by a lively thani avarthanam by young B Manohar on the Mridangam and N Hari Narayanan on the Ghatam. The concert concluded with a thillana of Lalgudi G Jayaraman in Mishra Shivaranjani. Saraswati Rajagopalan’s incredible skill over strings, speed and complete control over the instrument were all submerged in the bhava or emotion of each raga and sahitya. The final concert of the festival was Dhrupad recital by one of its foremost exponents, Ustad F Wasifuddin Dagar. Ustad Sahab began with a deep aalap in the gambhir and intensely beautiful raga, Darbari Kanada, with soft glides and powerful gamaks. Ustad Sahab kept up his style of gayaki all the while, maintaining the purity and aesthetic appeal of the raga. This was followed by a composition “Murari Tribhuvan Pati” in Chautaal. A brief alap of the raga Des came next and the recital ended with a dhamaar, “Saware Rang Daar Diyo”. Mohan Shyam Sharma on the Pakhawaj embellished the recital beautifully with his masterly playing. Truly a fitting finale to the two-day musical festival and rasikas appreciated both the concerts. Sunaad, set up with the objective of enthusing young people to appreciate the greatness of Indian Classical Music, organises Sangamam, the annual music festival bringing masters and upcoming musicians of Hindustani and Carnatic idioms together on the same platform. This year’s Sangamam festival was in honour of V Santhanam, founder-trustee of Sunaad, who is in his centenary year. He is a multi-faceted person, well-versed in Sanskrit and a great lover of classical music.